If you are searching for South Manchester Architects we would like to talk to you. Our passion and commitment. We are an established award winning, RIBA and ARB registered, design led architectural and interior design practice. Architecture is not just a job for us; we add value by developing exciting and innovative contextual/contemporary solutions to uniquely transform any project. Working across a broad range of commercial and residential sectors, we have over 15 years experience of taking projects from inception to completion. We have long established professional relationships with other related design consultants (such as structural, M+E, cost and planning consultants) as well as building contractors who specialise in projects of all scales; therefore as a team we can impart considerable expertise and construction knowledge in making your budget work hard. Below are links to some examples of our work. 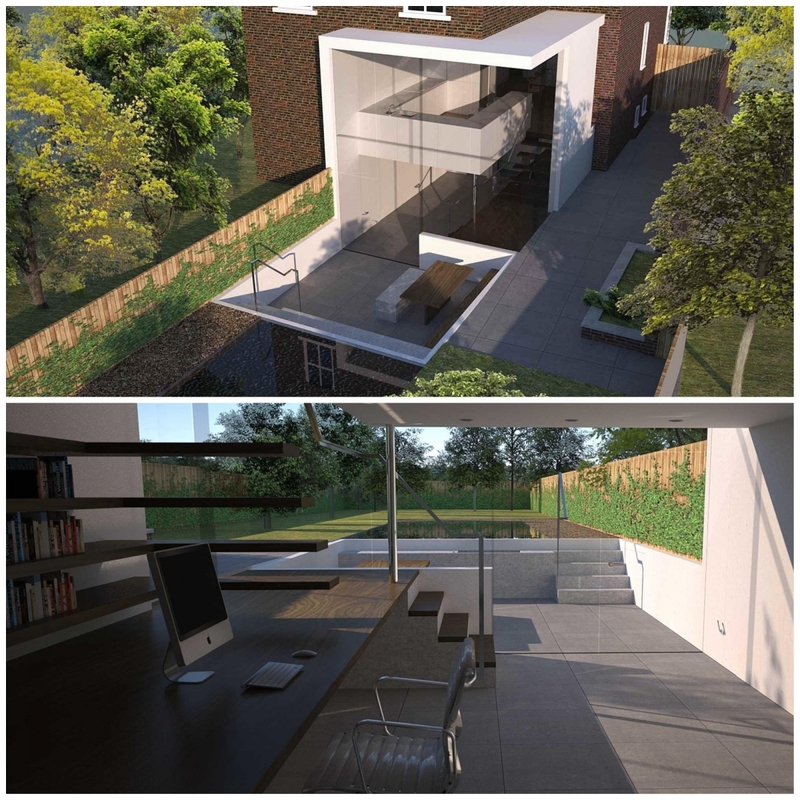 A brief look through these projects will demonstrate that we are amongst the leading South Manchester Architects. Please browse through the website and contact us to discuss your project in detail. The site is located in greenbelt countryside and comprises a small group of agricultural buildings. The brief involved the conversion of the grade two listed barn into a four bedroom family residence with a new building to house a swimming pool attached, as well as the refurbishment of the adjacent farmhouse as a residence for a younger family member. If you are searching for Interior Design Consultants Manchester we would like to talk to you. Below are links to some examples of our work. A brief look through these peojects will demonstrate that we are amongst the leading Interior Design Consultants in Manchester. Please browse through the website and contact us to discuss your project in detail. Conceptually the building is made up of three parts, each with its own associated material chosen to express the concept further. A solid plinth (light grey tile) anchors the building to the site and forms a continuous floor plane both internally and externally. From this datum the house rises, split into two distinct horizontal layers; a heavy base support layer (dark grey slate tile) made up of planes and blocks housing the living accommodation, onto which a light box rests(white render) housing the sleeping accommodation. Into this sensitive and restrained pallet of materials is added one more element; oak infill planes spanning full storey height on the facade rhythmically articulate the expression of room arrangements, and sliding oak partitions internally divide the fluid spaces. Through the composition of these forms, the building reveals its identity and programme. The brief was to fit out the basement shell of a very ordinary, characterless residential development into Code Computerlove’s new headquarters. Code is a digital marketing and communications agency that rejects a traditional, authoritative hierarchy, instead adopting a more equal, transparent, informal, social and fun approach to their company structure and work ethic. If you are searching for Interior Designers in Manchester we would like to talk to you. Below are links to some examples of our work. A brief look through these peojects will demonstrate that we are amongst the leading interior designers in Manchester. Please browse through the website and contact us to discuss your project in detail. This work ethic led to an interior layout that rejects the typical grid, uniform pattern of the traditional office environment with its cubicles and cells, in favour of extended linear grouped activities. The curvaceous interior and associated fluidity of the forms allow for a spatial flow that enhances co-operation, communication, creativity and visual stimulus within the company and its various divisions. A red swirling form serves to entice clients in from the pavement above, where, because of the nature of the site, the building below is not immediately apparent. This form flows down to the building’s entrance where it punctures the facade and morphs into the reception desk, establishing a dramatic and dynamic expression of arrival. Red was used as a bold expressive motif throughout and the success of this approach inspired the client to incorporate it into their corporate branding. 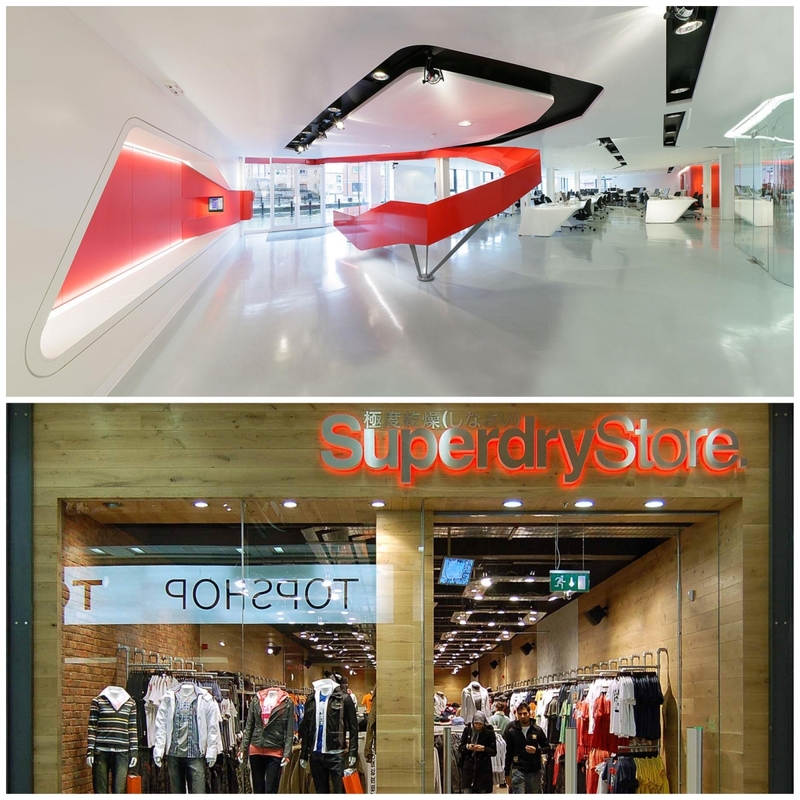 Superdry is a relatively new global retail clothing company. The brief was to develop and implement a design for a new store in Manchester’s Arndale Centre that sits broadly within their retail brand identity but expands this into a more contemporary expression.